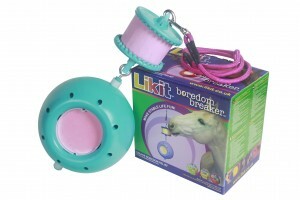 Give your horse a break with the Likit Boredom Breaker stable toy. Designed to be used in conjunction with delicious Likit treat blocks, the famous Boredom Breaker has long been proven to have a beneficial effect on equine welfare, providing environmental enrichment by keeping the horse occupied and entertained when stabled. Just hang in the loose box and fill with tasty Likits to keep your horse happy for hours. Contact Likit Products on 01655 750523 or visit www.likit.co.uk for further information.